With Valentine’s Day safely out of the way, it seems a good time to reflect on love. My thoughts have particularly focused around the topic of first love. 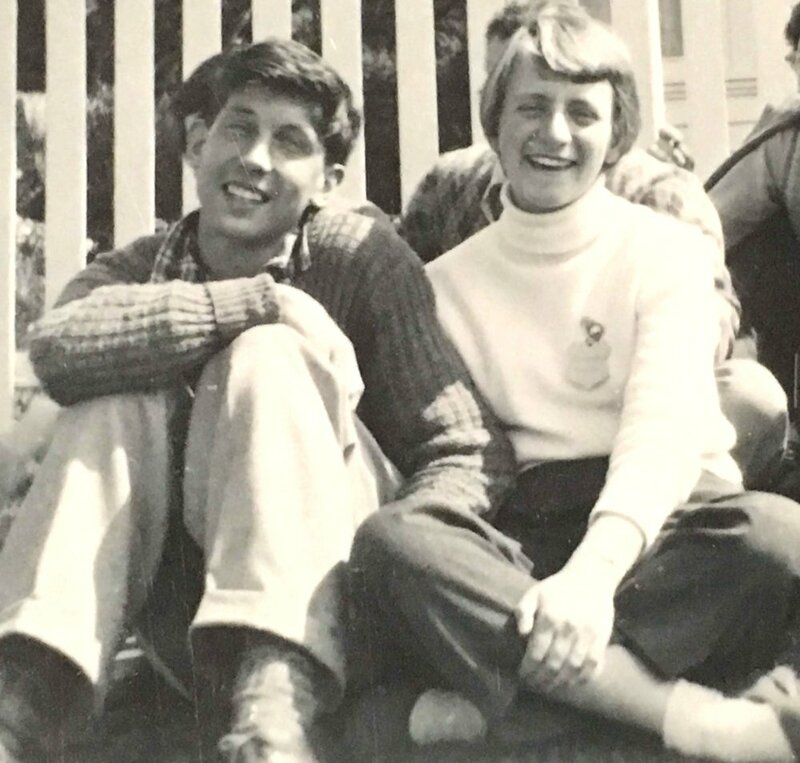 For many of us, looking back on our first love can leave us with warm fuzzy feelings - for me, looking back on this cute very early photo of my parents’ relationship certainly gives me a different perspective! But is there anything new that can be said about first love? When I hear the term “first love”, it usually takes me straight to Revelations 2:4-5. How many messages have you heard where this passage is used to try to kick start a congregation into activity? The disappointment God had with the church of Ephesus was that they had forsaken their first love. He calls them back to “doing those things you did at first”. Many a pastor or leader has called out a congregation on the same. It can seem quite a harsh word, but I am wondering if there could be some connotations of this topic that are less about condemnation and more a call to be…well...loved. The passage in Revelations is usually presented from the perspective of when we first loved God and that it is our love for God that motivates us, energises us, provokes us to action. But perhaps this is all wrong. In fact, I think it is categorically wrong! And further to this, in 1 John we find a book that is all about God’s love for us - in a nutshell, it tells us we really cannot give love to anyone else, including God, effectively, or maybe purely, unconditionally, unless we have first experienced Father God’s love for us. before anything was created there was love. In turn, this means that all of creation was created within the context of love; creation is a product of love. If we understand all of creation in this way, we can start to understand God’s love for creation: His love is intrinsically interwoven into every aspect of creation. We are bonded together with all of creation by God’s love. Sit with the connotations of that for a while! Unfortunately the separation that occurred between us at the fall, meant that our relationship with the rest of creation was also fractured. Instead of being bonded in love, we are now in competition for love. We have put conditions on love and we live out of those conditions. And so, for most of us at least at some level, we still believe that, or act as if God’s love is conditional on our behaviour. We still live our lives at certain points feeling distant from God because we feel we may have failed Him, that we may not be living out of our “first love”, or that our continuing mistakes prohibit us from His love. We work so hard to make ourselves acceptable to Him, to make ourselves good enough to deserve His love. Surely this is a central (if not the central) facet of the Gospel message: We don’t have to be good enough to receive God’s love, to get to have relationship with Him. In fact, He already went ahead of us and fixed the problem before we could even try! This is so liberating. This is FREEDOM! God’s love is not based on our performance! Hallelujah! Over the years, I have often reflected on this. While we can read it at surface level, particularly that some are worse sinners than others (aka, “I thank You God that I am not as bad as that tax collector/banker/politician over there”), I personally don’t believe this. I think that it probably relates more to how much we have experienced or seen our own sinfulness and brokenness. There have been suggestions that this woman was perhaps the woman caught in adultery. Her sin was in full view, and she was about to be killed for it, had Jesus’ wisdom not prevailed. She could not escape, hide, or minimise it. Jesus’ forgiveness for her was the very difference between her life and death. Unfortunately for many of us, we don’t see this distinction clearly at all. We often have no idea or perception of the way in which so many of our actions, attitudes or words are heading us down the path that leads to spiritual death. We are in happy oblivion or denial. It is only as we become aware of how destructive our brokenness is, that we realise more fully how lost we were and what danger we were in. (Eph 3:18). If you read the whole passage here, it returns us to our experience of God’s love for us. The reality is that we don’t have a capacity for love outside God. If we want to love God more and love others more, then we have to humble ourselves and allow Him to love us: to pour His love into us and over us, again and again. As we are filled again, our response is naturally to love Him in return, and from here, our love flows out to others. It can be a challenge to return to the first time you were really aware of experiencing God’s love. For some of us, it is a very long time since we have truly experienced the absolute joy found in the realisation of how much God loves each of us. For some, sadly, we may not feel as though we have ever really experienced this love. It may be that although we have given intellectual assent to the idea of God’s love for us, we still grapple with living from this place. The place of experiencing God’s love for us, however, is a place of surrender. Unless we are prepared to let go of some of our ideas and beliefs about the way in which the world operates, to humble ourselves and accept our need, it can be quite difficult to allow God to unleash His love on us. My prayer is that you have had at least one experience like this that leaves you aching for more. It is not a place we can reach through our own efforts, though – in the end, it is a place where we have to believe that Jesus’ gift was enough to allow us to come into this Holy Place. We have to be prepared to lay down our pride and self-serving. We have to be prepared to be vulnerable, naked and exposed before our God. And it is in this place we discover that His love for us is unending and yet somehow the beginning of it all.